“Working with Martinovich Jewellery to design our wedding rings was stress-free, rewarding and fun” Dr Jack Rivers-Auty. 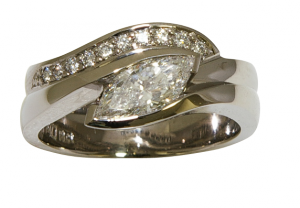 Traditionally the wedding band has been a simple yellow, white gold or platinum band. For those wanting to do something a bit different, there are no rules. You may want to wear just one ring therefore not limiting the design by other rings worn on the same finger. If you love big bold styles or asymmetrical styles for example, then having just one ring can be a great option.